Welcome to our village’s website. Here our Parish Council publishes its meeting minutes, financial documents etc to satisfy the Government’s Smaller Authorities Transparency Code. It also serves as a source of information about the village, our church and upcoming events. Eryholme is a North Yorkshire settlement of some 70 inhabitants on the south bank of the river Tees. Although close as the crow flies to Darlington it is in a tranquil corner of the countryside, described by Elizabeth Montague, the lady of the manor in 1775, as ‘a perfect paradise’. It is and always has been a farming community, today forming part of the Neasham Hall estate. Its simple church dates from ca 1200 and was restored sympathetically in 1889. The village was once much larger and more concentrated than today, as deserted medieval house platforms in its fields reveal. First recorded in the Domesday Book in 1086, it had an eventful early history, being sacked twice, ravaged by epidemics, almost abandoned before 1500 and convulsed by rebellion in 1569. 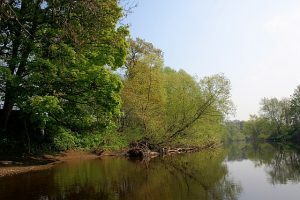 Its farmers pioneered the improvement of dairy livestock in the eighteenth century and until 1750 it was part of the Great North Road, crossing the river Tees from the south to Neasham by ford and ferry. It is now peacefully off the beaten track. Aficionados of Downton Abbey may recall that the Countess of Grantham regarded it as nice enough a place to live if one wanted a retreat from the world.